At its core, this blog chronicles the challenges, joys and discoveries of my work as an occupational therapist. Well, hello there! Thanks for stopping by my corner of the world. This blog is all at once a time capsule that includes the years I spent in OT school, my current experiences as a fairly new grad OT, and my frustrations with and hopes for the profession of occupational therapy. I’m currently based in North Carolina and I’m a proud alumna of the University of Chapel Hill’s MSOT program’s Class of 2016. Since graduating I worked briefly as a school-based OT and am currently working as an OT in an acute care hospital, but who knows where my career will take me over the next few years! At the moment, I’m pretty active in various professional associations, serving within the North Carolina Occupational Therapy Association, the Coalition of Occupational Therapy Advocates for Diversity, and the American Occupational Therapy Association in various capacities. I’m passionate about encouraging OT practitioners to demonstrate excellence in their everyday practice, be professionally engaged, and using my knowledge and skills to help patients achieve or return to meaningful lives. My clinical areas of interest include neurological disorders, community-based practice, mental health, veterans and military families, and facilitating independent living for people of all ages and abilities. When I’m not working on OT-related activities, I find occupational balance by spending time with friends and family, traveling, volunteering at church, reading, and thrift shopping. Happy reading! My mother is a registered nurse who works in a Veterans Affairs outpatient clinic. My father is retired from a 20 year career in the military, and he is now a postal worker with his associate’s degree in Criminal Justice. He has deployed on multiple occasions to places around the world, including Germany, Korea, Kuwait, and Iraq in my lifetime. My mother’s work as a nurse and my father’s military experience inspired me to find a health career in which I could work with military men, women and families, and that’s how I found the wonderful field of occupational therapy! I’ve known my husband for nearly half my life, and I have been in a long-term and long-distance relationship with my boyfriend for over 4.5 years. We met in high school and we have been together throughout my 4-year college career, my 2 years in grad school, and just over 2 years of marriage since 2016. Although it has not always been the best of times, I love being with him because he always knows how to inject some rationality into my insanity and bring calm to my anxiety. I consider myself an open-minded intellectual who enjoys meeting new people, learning about their experience of the world and traveling to see how life around the world is both very similar to and very different from what I’ve grown up with and what I know. My path towards becoming an occupational therapist began back when I didn’t know what occupational therapy was. I was in my sophomore year of college, trying to find a career that combined all of my interests – creativity, health care, communications, education and psychology – into something that I would enjoy and that paid well. After talking with my pre-health careers adviser, I agreed to shadow a few people in healthcare-related fields and see what I might like to pursue. I talked to my mom about her career in nursing, shadowed a physical therapist and even asked a veterinarian about what she did. But none of these careers were quite on the mark. Then, in the summer of 2012, I started volunteering with the occupational therapists in the outpatient therapy department of a local hospital. After only a couple of days in the clinic, I knew that I was meant to be an occupational therapist. I couldn’t think of any other career in which I would be able to use my knowledge of anatomy and physiology, my background in cross-cultural studies, my Spanish language skills and my desire to help other people in such a unique and impactful way. And so my love affair with occupational therapy began! Thank you so much for making this page! I’m a current undergrad, and I, too, want to work with veterans and individuals with TBI and PTSD, and my father is also ex-Military. It’s so great to find an outlet such as this to help me in my grad school search! Thanks for commenting! I’m glad you find my site useful, and it’s great to know that there are other people out there who are interested in working with veterans. Please let me know if there is any other information you are seeking throughout your grad school search, and I would be more than happy to connect you with resources and information about OT! Best of luck with the grad school process! Just trying to decide if I should go to an expensive OT grad school, or wait to see if I get into a less expensive school (I am 7th on a wait list), or take a gap year & work and try to reapply to some of the same schools or even a couple new programs? I would love to hear your perspective! 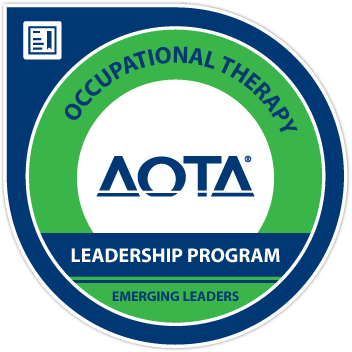 “When becoming an OT or OTA, there is one final step after finishing your educational requirements, and that is obtaining a license to practice! Most states, the District of Columbia, and Puerto Rico require occupational therapists and occupational therapy assistants to have a license to practice in each respective state or territory. This is what gives an OTR or OTA the “L” at the end of their credentials (OTR/L or COTA/L). If you think you may be moving around during your time as therapist, it’s important to keep in mind that a different license is typically required to practice in each state or territory. The licensure process varies slightly by state, but does tend to be similar. The basic steps for obtaining a license are: 1) graduate from an accredited OT or OTA program, including completion of all fieldwork requirements, 2) pass the NBCOT exam, and 3) apply for a state license and pay a fee. To locate the licensing agency in your state, please refer to the AOTA website. thank you so much for the information! I am currently an undergrad in Spokane and I am hoping to go to OT school so your site is extremely helpful! Thank you! I’m glad you found my posts helpful! Best of luck applying to OT school, and feel free to comment or email me at Gottabeot1@gmail.com if you have any questions! I have stumbled on your blog and instantly fell in love with the wealth of knowledge you provide!! I am just starting out, literally, finishing my prerequisites so I have a long road a head of me, so I greatly appreciate the supportive attitude you provide. Thank you!! Hello Linnea! I’m glad you found my blog and that it’s been helpful to you. 🙂 Congrats on finishing your prereqs, it’s no joke going to OT school! I hope you have a great year, and please email me at Gottabeot1@gmail.com if you have any questions in the future! Good luck! Awesome story! It’s easy to see your passion for the field. When will you become an OTR? Thanks! I really do love OT. I’ll be done with my last fieldwork and academic requirements by August, so I’m hoping to take the NBCOT exam around September and start practicing this fall! I would just like to thank you SO MUCH for having this blog. It really is a testament to your passion for the OT profession and is incredibly helpful for people who are just becoming interested in the field like me. Thank you, thank you! I just wanted to thank you so much for starting this blog. It really is a testament to your passion for the field and is incredibly helpful for people like me who are just starting to learn about occupational therapy. Thank you, thank you! I am hoping to provide awareness to your audience of our company’s 3rd annual Scholarships Program awardee in the Allied Health field. This specific scholarship was created for students who have dedicated themselves to helping others in the Allied Health industry and have a need for financial funding. This year’s recipient is an Occupational Therapy student from Red Springs, NC! We would like to provide this student some local and national exposure to celebrate this accomplishment, as well as, create awareness for future students to apply. I would appreciate any help in channeling this information to your audience. I have a MS Word doc press release and photo that I can send you. Please let me know your thoughts on this. I am an OT with many years experience. Like many of you I had a specific population I wanted to work with when I was in school. In my case, it was burn patients. As it turns out, my career took me in very different directions! I have loved every minute of it. Every patient has contributed to my book of knowledge. Keep your options open! I have never worked with burn patients! Thanks for commenting, Karen! That is great advice, as both of the jobs I’ve had since becoming an OT have been in settings where I’ve had little or no experience. Every day is a learning experience, and it’s such a versatile career that I know I can choose to specialize or stay a generalist. Yay for OT! I am a semi-retired OT educator who teaches an anti-racism workshop to first year MOTS. I have an African American male student this year and he is, I think, feeling a bit like a unicorn because he asked me if there are other black male OTs! I’m was googling to send his a link to AOTA;s Black caucus and I found your blog. I’ll be sending him this link too. thanks for all you do. Hello Dr. McGruder, and thank you for your kind words. I am part of the Board for the Coalition of Occupational Therapy Advocates for Diversity, and there are two amazing African American male OTs as part of our organization who I’m sure would be happy to talk with your student about their experiences and his experience. I’m going to Google your info to see if I can find you to connect! I would like to personally congratulate you as your blog Gotta Be OT has been selected by our panelist as one of the Top 75 Occupational Therapy Blogs on the web. I personally give you a high-five and want to thank you for your contribution to this world. This is the most comprehensive list of Top 75 Occupational Therapy Blogs on the internet and I’m honored to have you as part of this! Hi, Can you repost a link to the Cotreat Article you authored in Advance? I found it on another blog, but the link does not work. Hello Amy, I did not author an article on co-treatments for Advance, so I don’t think I can help you with this. Sorry!